~~- Thank you for your interest in Captain’s View. The view is literally as if you were standing at the bow of a ship! 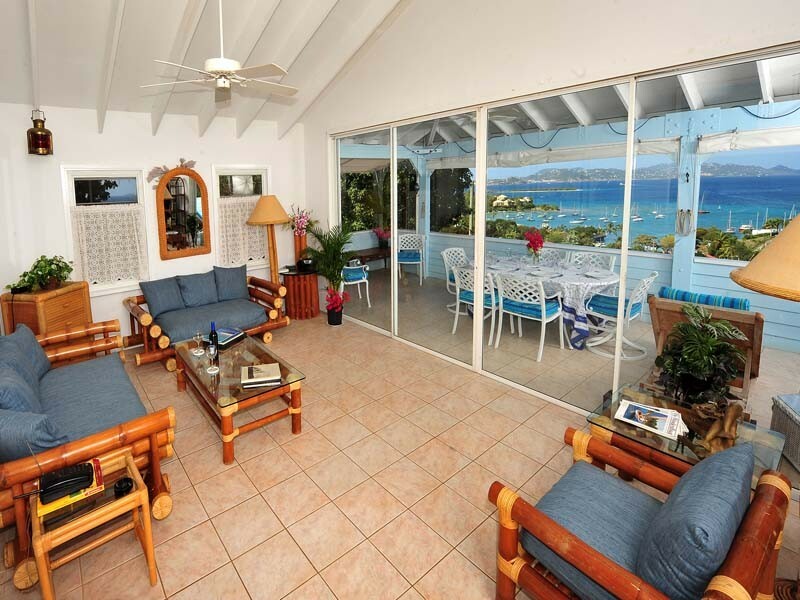 Amazing views of our Cruz Bay waters, this is a lovely, spacious top unit in a townhouse overlooking town. Just a short walk to the ferry dock and taxi stand, it is easy to skip renting a car. 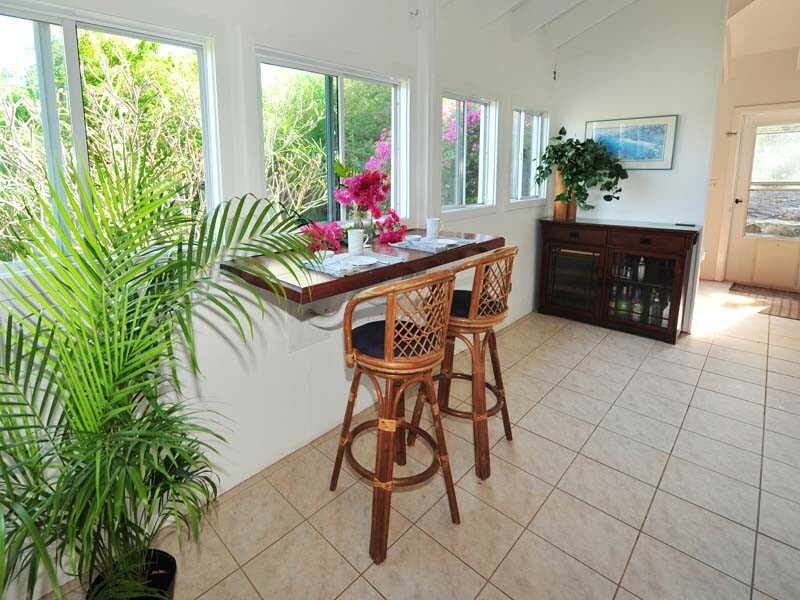 Complete with all the Amenities - pool, grill, viewing deck with dining area, and private parking - it is conveniently located near restaurants, markets, shops and a short drive to the famous north shore beaches in our National Park. we stay at captains view twice a yr. it is a great place. house is great. the view is awesome. love sitting on the deck watching the ships come and go. we have always felt very safe there. you can walk to down town very close to dolphin market. has a shared pool. everything you need in the house. 2 ac bedrooms .2 TV's. there is a one bedroom apt under captain view it is great for a couple, we stayed there 6 times. no one ever bothers you, most of time we feel like we have the place to ourselves.. we cant say enough good about captains view.. BJ the owner is awesome, if you need anything done at the house she is always kind and helpful. My wife and I loved the place, the views and the setting. We had only one complaint, which was the AC really struggled to keep the back bedroom cool. It was pretty darn hot and it just couldn't keep up. We'll be back. This apartment is large, airy and has large deck with great view. We also enjoyed having a swimming pool. We had a problem with one of the sinks but the hosts took immediate action to correct it. We never did find the remote that controlled the air conditioner in the bedroom nearest to the living room. That air conditioner is old, inadequate and needs to be replaced. Overall the Captain's View was a great place. I've stayed in St. John before and this place is great for the location and price. Very clean and comfy. If you plan to ealk around town, it is close enough to be anywhere in 5 minutes, but you should be in good shape as you are at the top of a hill and it gets steep at the top. So rent a jeep. Beds are comfy. Ac in the bedrooms only, not in living room. Fantastic view from patio and private pool is down the steps. House is older so things are a bit dated, but very comfy and for the price and location, it's a great choice. Our visit was interesting. The washer didn't work. There was a dead bug in the refrigerator when we arrived. There was also a salamander trouncing around the bedroom when we arrived. It was burning hot in the place most of the time. The only A/C is a window unit in each of the bedrooms. One of them didn't work very well so we spent 99% of our time in the other bedroom except at night when it cooled off a little. One of the biggest complaints is the roosters outside wake you up every morning at 6 pm and sometimes even in the middle of the night. It made it really difficult to ever sleep in or get a good night's sleep. Also, the bed was on wheels and any time we even slightly moved it would move to the center of the room. The windows were all open, and the A/C was off when we arrived so it was blazing hot. It would have been nice to walk into a cool room after being out in the hot weather. Several of the handles on the windows didn't work so we couldn't close all of them. 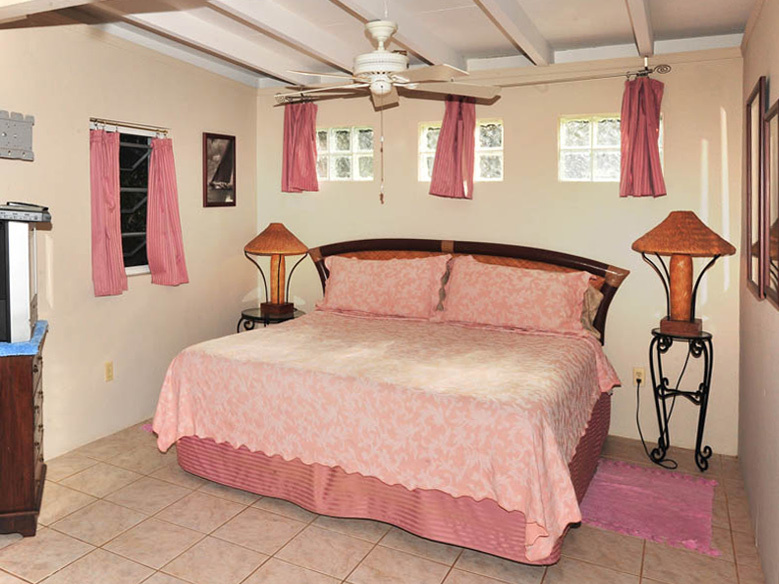 Nemisy, our contact at St. John properties, was available and responsive so no complaints there. On the positive side of things, the view and location were both really great. The place was fairly clean overall as well. In summary, it was an average experience at best and we will probably never stay here again. There is no better view than the one from the porch at Captain's View. It is close enough to town to walk and yet high enough to always have a nice breeze. Excellent stay for all concerned. Tremendous views. Great location. Pictures do not do it justice. 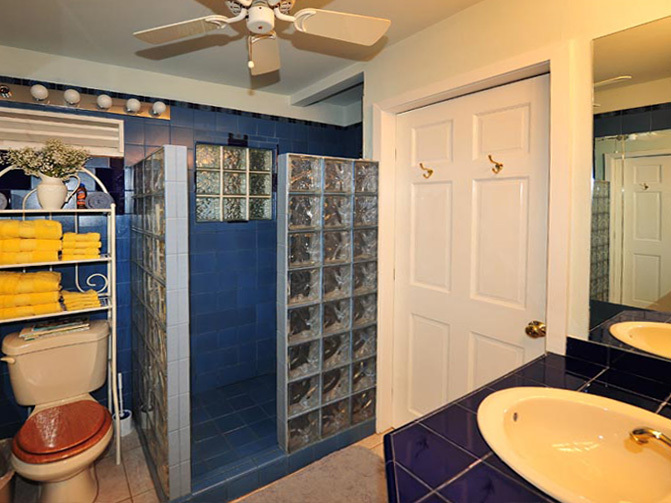 You must see it to truly appreciate the views and spaciousness of the interior. A very lovely and convenient place! We had a wonderful stay at Captains View. What an awesome view from the balcony! We enjoyed that probably the most. The walk to town is short, so the location is excellent. A few things are run down, but over all, a very comfortable place to stay. We loved our stay in St. John once again. There are some stairs and decks that need repair - we were worried about falling through in a few spots - would also like to suggest a Keurig for coffee, tea, and hot chocolate drinkers instead of just one coffee pot - we had three different types of coffee drinkers, with caffeine and without - this would a nice to have. Thanks again, we'll be back. We consider Captain's View our "Home-Away-From-Home" only better! The weather is better, the surroundings are comfortable and the view is incomparable. Nemisy and the St John Properties team always makes us feel welcome so our vacation starts on a peaceful, beautiful note with fresh flowers and morning coffee. And there's no worry about getting in touch if we have a problem (we never do!) We couldn't be happier! We had a great time at Captain's View! The bedrooms were very nice and a/c worked fine. 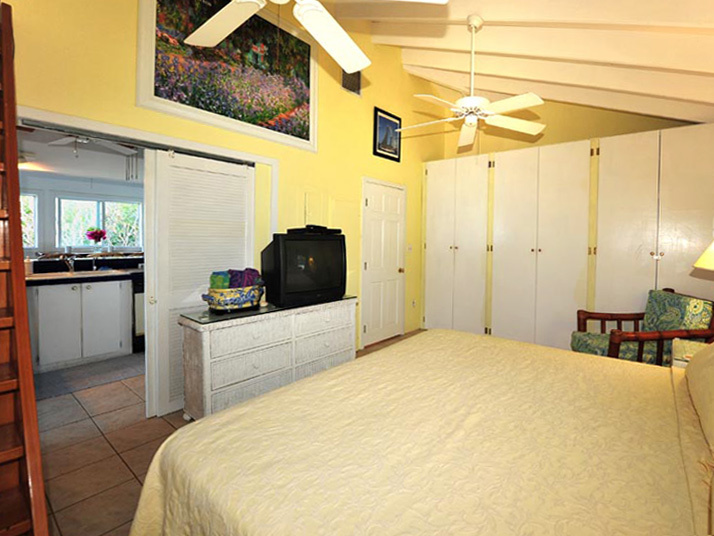 Furniture throughout the villa was very comfortable and the balcony provided us with a great view of Cruz Bay. 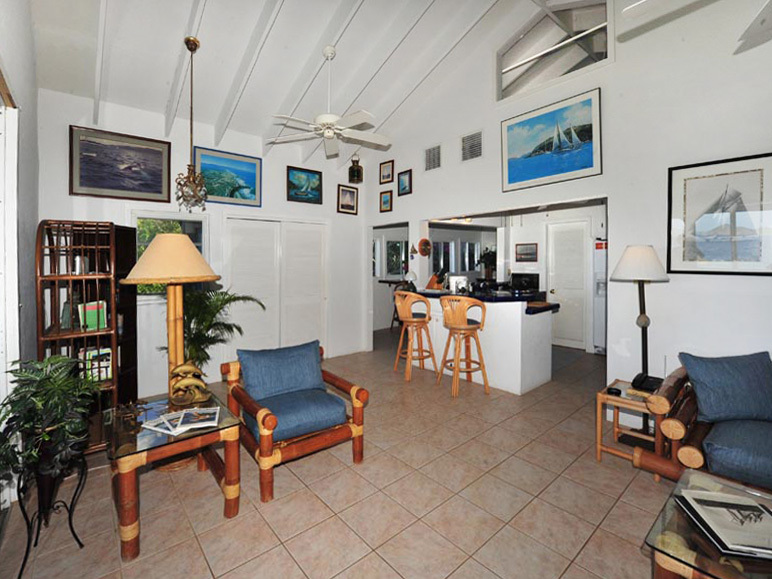 The villa was well furnished with towels, coolers, some snorkeling equipment, and beach chairs for our beach excursions. The pool was great for relaxing at the end of the day. The only negative was the construction that was going on below the villa. It was quite loud at times and went on for most of the days we were there. Even though we were out most of the time we were still there at the end of the day when they were still working. We would definitely stay there again! We love the view from the deck. We love Captain's View! We have been staying here since BJ started renting it! CV is our St John home! We look forward to returning as the plane takes off to take us back home! Breakfast and dinners with our beautiful view. We have that view framed above our bed at home. We can have a bit of our island time everyday!! CV has everything we need - even our island kitties! Can't wait till next January!! We really enjoyed our stay at Captain's View! The hill is a bit steep but we managed just fine and we are in our 60s. Once you are there, the view of Cruz Bay and beyond was a great way to start and end each day. Location close to town also a big plus. Nice decor, comfy beds, well stocked kitchen, wonderful time! This was our second time renting Captain's View. 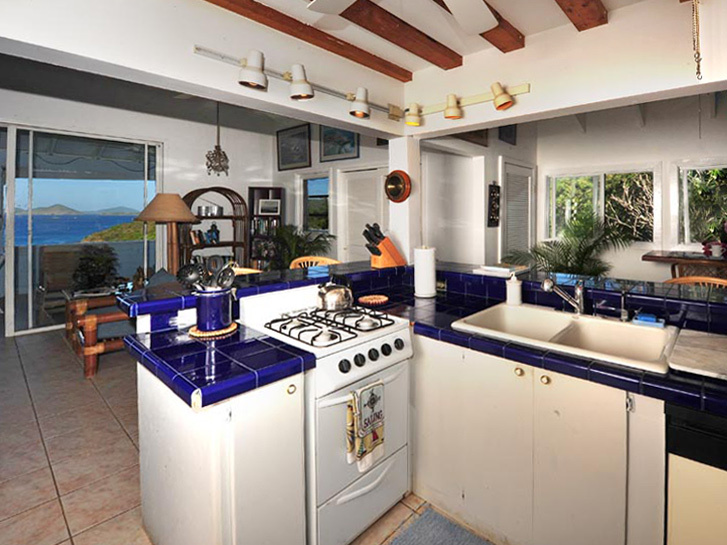 It is so convenient to town and has a great view of Cruz Bay and the harbor. You feel like you are right there in town as the music drifts up the hill from the restaurants and bars below. It was easy to walk down to town. The walk back up the hill is a little harder (350 steps from the corner of Dolphin Market's parking lot to our front door - not that I was counting Lol.) We will definitely stay here next time we are on St. John. We were very pleased with our stay at Captain's View! The set up of the villa was perfect for two couples. My husband loved the double ceiling fans in the bedroom closest to the kitchen and I loved how much light was in connected bathroom. We loved having a full size refrigerator with an ice maker. The view at this villa was amazing. We loved having an unobstructed view of Cruz Bay. We would sitnon the porch for breakfast and watch the boats come in and out picking up charter guest. The kitties on the proptery were a bonus, we loved having the company of the old grey and white cat, he loved to snuggle on the chairs outside. The other kitties were very skittish but we buoyed seeing them come up to eat from time to time. The only improvements that we would suggest would be having hot water in the showers last longer (we usually ran out of hot water within 5-10 mins, not a big deal but would have been nice) and, a TV in the living area or the ability to move a TV from a bedroom and have cable in the living area (there was a football game on that we wanted to watch as a group while we cooked/are dinner). these two things are minor and did not greatly affect our stay. Overall everything was fabulous, and we loved how you all let some snacks and drinks in the refrigerator for us when we arrived, that was a nice surprise. 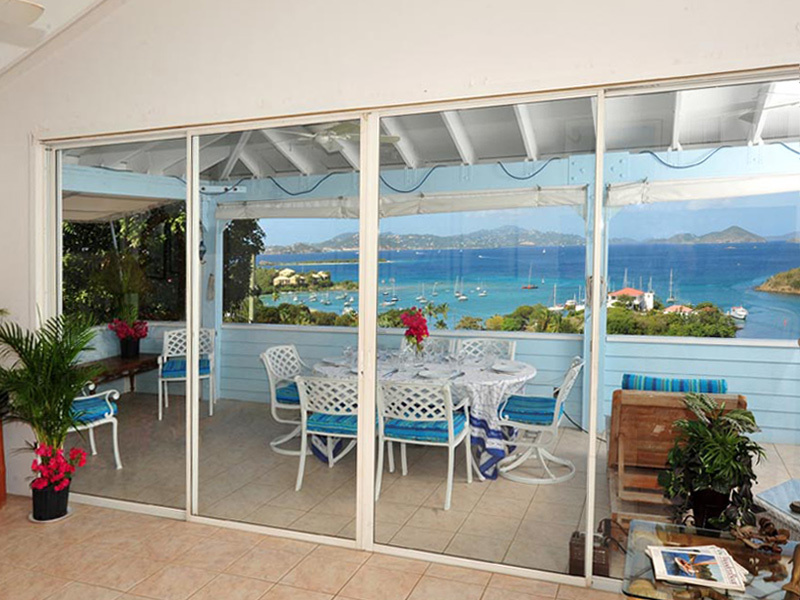 We would definitely stay in Captain's View again (this is the first villa that my husband has actually wanted to return to) and we will recommend St. John Propteries to anyone coming to stay on island. Our home away from home!! Dinners and breakfasts on the deck. Love our view! The house is perfect! We look forward to our visit every January! Although it wasn't nice of Irma and Maria to damage the sliding glass doors , the new ones are lovely! BJ and Pamela take care of every detail . The countdown is on to next January!! Thank you so much!! We had such a wonderful time!! and all the little details which make it home away from home are in the villa.